What? You say Mondays can’t be happy? Well now it’s all a matter of attitude. MAKE your Monday happy….if you aren’t expecting it to be a good day it probably won’t be……..but if you EXPECT it to be, it probably will be. Wanna know what I did all day yesterday? NUTHIN. ZIP. I napped, ate some grass in the front yard, napped again and then the highlight of my afternoon – I sat on Mom’s lap and watched football. Rah Rah Rah…….Sis Boom Bah! I’ve been reading on so many of my blog buddies’ blogs that they have snow………we got a surprise yesterday – it went all the way up to sixty-five degrees…..sunny, breezy, VERY Spring-like. Mom was thrilled – she actually went outside and did some gardening (well, she pulled some sticks out of one of our gardens and cleaned up some mum debris from last Fall – there are little green tops of mums popping up already!). Anyway, the point is, it was a very unusual day in the weather department. I know a lot of my friends out there are very excited about their weather (snow) too……..If you love it – I’m glad you have it! 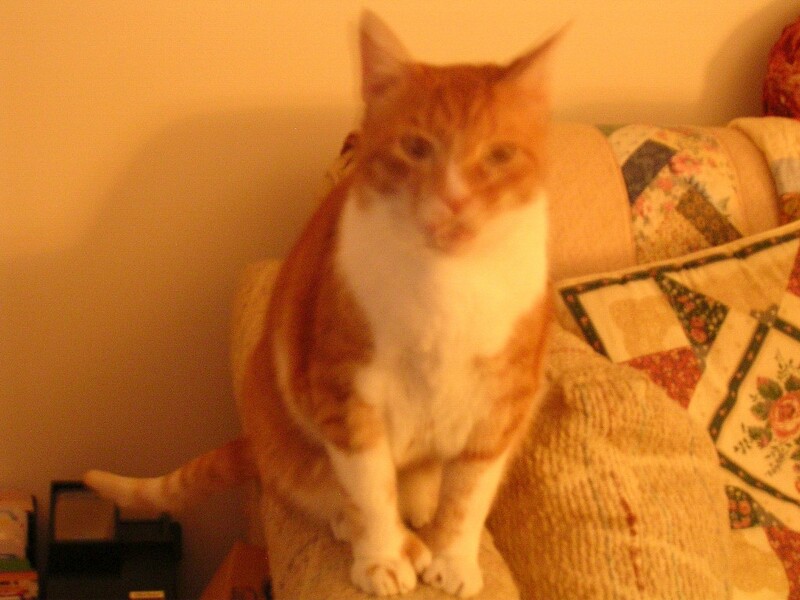 Tomorrow is Tuesday Teaser………..Mom and I have NO IDEA what photo to surprise you with but we’ll work on it today. I promise. I’m going to try and find one that has NO HINTS in it (like signs you can zero in on and read, etc.!!). So get ready to squint at the screen! Gimme a warm spot by the fireplace any old day! Gosh………where has this week gone? I can’t believe it’s Caturday already……maybe because I’m getting older time is moving more quickly? Hmmm….I’m not sure I like that!! Mom says when she was young time just dragged by…..everything just plain took FOREVER to arrive – now just like me – she says time is flying. 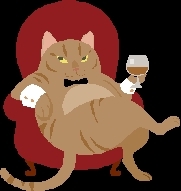 Oh well………Caturday Here We Come! First of all Caturday means bacon. No complaints there. YAY! Is that bacon I smell????? Secondly it means both Mom and Dad are home and don’t go anywhere. No complaints there (more lap time for me). Thirdly I don’t have to worry about housecleaning or laundry activities because they were done Thursday and Friday. No complaints there (except I do kind of like it when Mom puts fresh sheets on her bed). 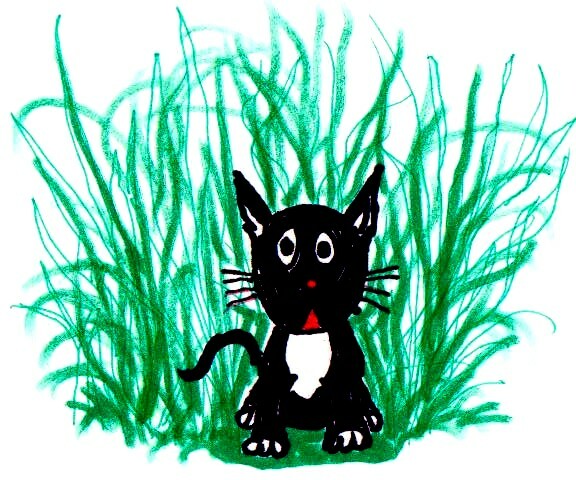 Here’s what “Feral” looks like – this is him as a tiny kitten after he’s been separated from his Mom and he’s wandering on his own – he’s in some deep grass and sees a human for the first time! Can you tell he’s scared???? 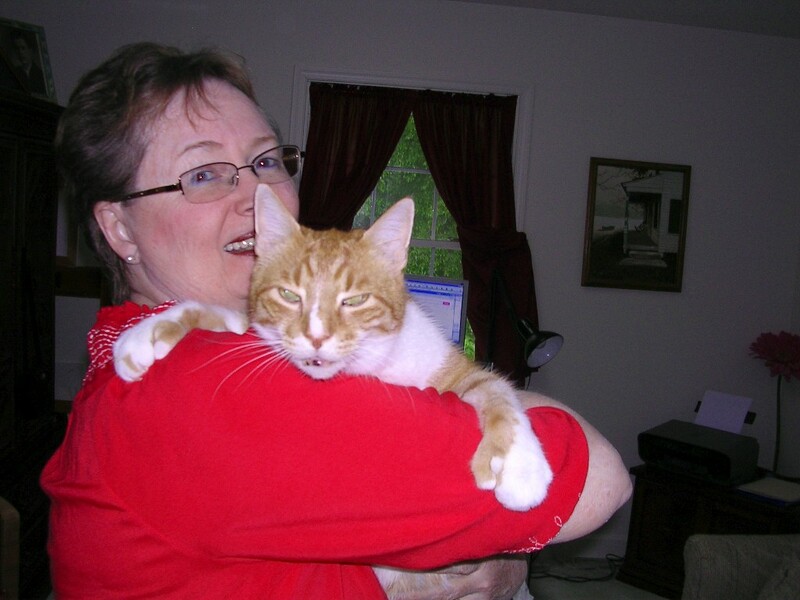 I bet I was scared when I saw my first human too…..
Feral sees his first human……. Well, I guess that’s all that’s happening in my world. How about you? Anything exciting going on? I’m still somewhat pouting that we didn’t get any snow after they promised me 1-3 inches. But I promise by the time I get my bacon this morning for breakfast I’ll have forgotten ALLLLLLLLLLLLLLLL about snow! Kitty Hugs and Happy Caturday! Guess who was on our front porch yesterday morning……………….YEP! Mr. Possum having breakfast. Dad saw him and called Mom who was on the computer upstairs at the time……..she quick grabbed her camera, came flying downstairs and was able to get this photo. SADLY, he had just climbed OUT of the water bowl (where he was sitting while eating) and had started washing his hands in the water bowl……………That’s why this photo isn’t as FUNNY as it would be if he was sitting in the bowl as seems to be his favorite place to sit while eating. After Mom successfully got the photo (it was light enough out there she didn’t need to use the flash thank heavens), she was standing there watching him and he backed away from the food and water bowls and waddled (!) off the porch. 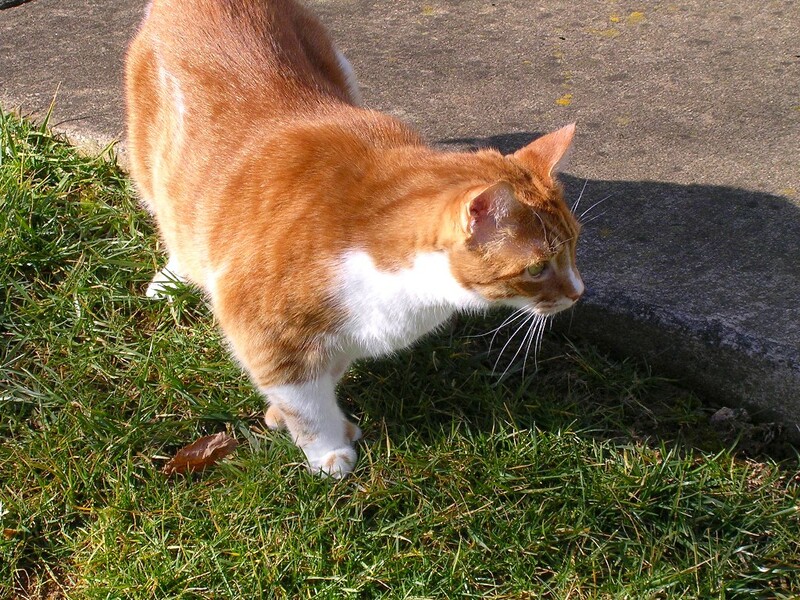 That’s when Mom got a really BIG surprise – Stevie our neighborhood moocher cat was SITTING RIGHT THERE WATCHING THE POSSUM. She was on the porch – sitting about two feet away from the possum just watching him! Possums can’t see well so maybe HE didn’t know SHE was there but SHE certainly knew HE was there – – – – and that he was eating all her food! The minute Mr. Possum waddled off the porch and into the yard, Stevie looked in the windows at the front door and gave Mom the “HE ATE MY BREAKFAST!!!! !” sad face…..Mom filled the bowl up again and Stevie finally got her food. How funny is that……………..I thought Mom and Dad would never stop laughing. So needless to say, after all that excitement yesterday morning, having the monster out of the closet and all that cleaning activity will be a piece of cake around here today. 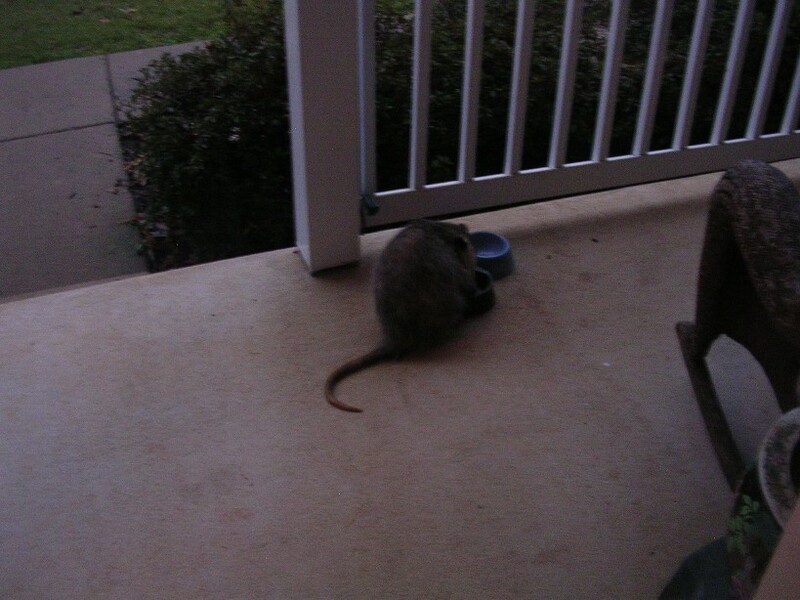 I can handle anything if I can sit at my own front door watching a possum sit in a cat water bowl eating cat food while the cat the food is meant for watches. Mother Nature is full of surprises…………..yes indeedy! Oh – before I forget – have you seen Mollie’s beautiful Valentine’s Day bandanas??? Perfect for any of you who are going to Mollie and Ranger’s Valentine’s Ball but can’t figure out what to wear! Check it out and order yours today – there’s time to get it before Valentine’s Day and you don’t want to show up naked now do you??? Hmmm????? 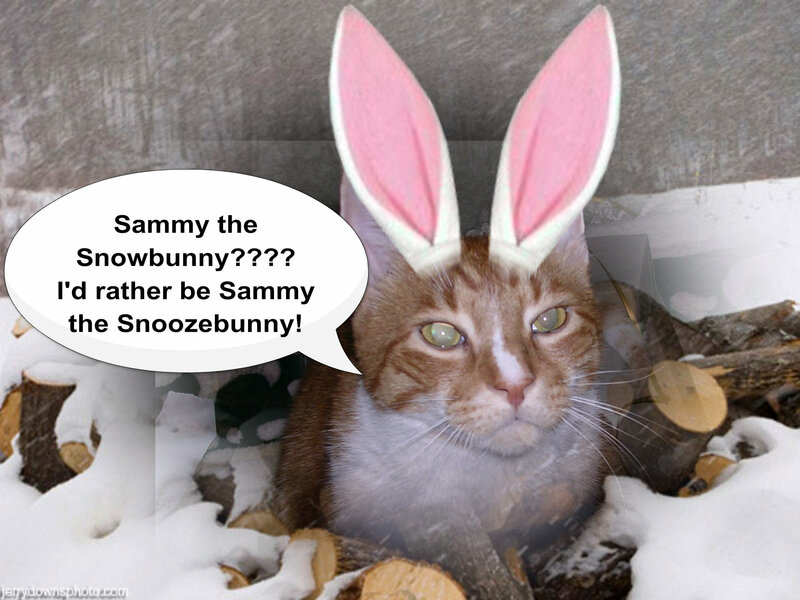 Crazy possum…Mom says “truth is stranger than fiction” – although considering the stuff she writes I’m not so sure! I know most people do a “Wordless Wednesday” posting but today I’m shaking things up with a “Wordless Thursday” instead. Why? Because my Mom was gone ALLLLLLLLLLLLLLLLLLLL day yesterday and didn’t get home until late so she was too tired to help me get a decent blog done for this morning. Harumph!!!!! So, instead of some words of wisdom or a snappy story, I’m posting a picture of ME and my Mom………you’ve seen it before – but it’s the best I can do without Mom’s help. Don’t worry – I’ll get even before the day is out!!! 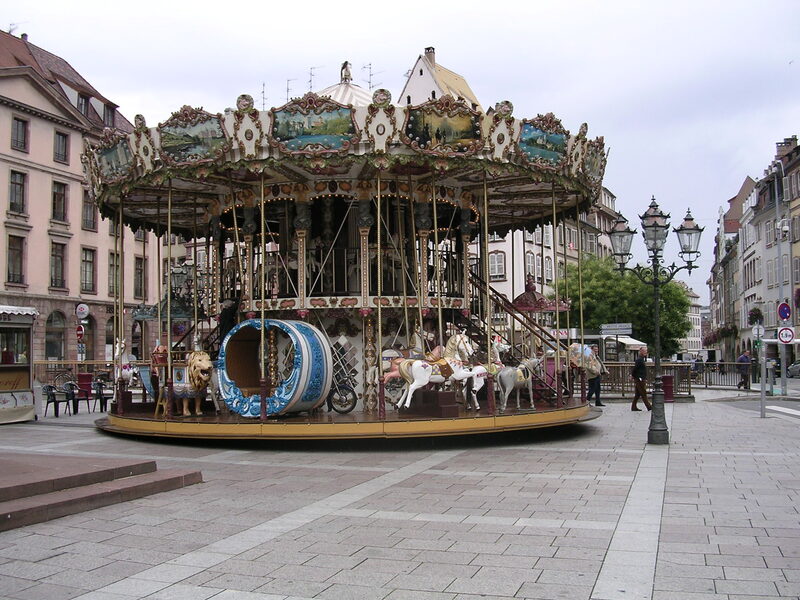 So, seems many and I do mean MANY of you thought the carousel photo was taken by Mom when she and Dad were in France. The truth of the matter is that they were in Strasbourg, France! It was a stop during a river cruise on the Rhine River – and all of the other passengers got off the ship and boarded buses to head into Strasbourg for the day……….my parents decided to take a taxi on their own instead of going with the group. They wandered the streets on their own and explored on their own……..and this was a pretty little square they found with a really neat old fancy carousel (which wasn’t operating at the time). 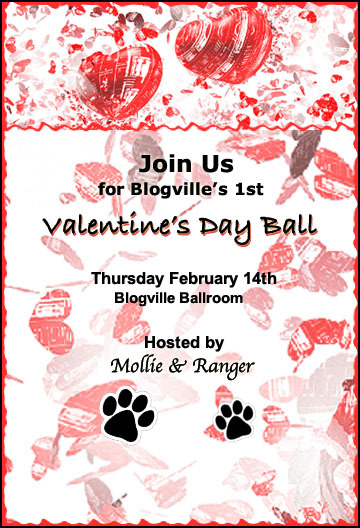 Also, just another reminder that the big Valentine’s Ball is coming up hosted by Mollie and Ranger and if you don’t already have a date – well they’re going to help you out! Meanwhile, hope all of you have a super special Wednesday…….we’re slowly sneaking up on the weekend – it will be here before you know it! Are you all ready for the challenge for this week? Well, I’m not quite sure if it’s as hard as or easier than last Tuesday BUT I will say that even I can see a few “hints” in this photo. This was taken by my Mom (who else?) on a trip she and my Dad took in 2007. She said it started raining about ten minutes before she snapped this photo – she was sitting on a bench in this little “square” admiring this fantastic carousel, and Dad had wandered off to find something for Mom to drink (not a martini…..a cocoa or coffee!!). Now, on to other things! As you probably know if you’re in the loop for where all the “happening” parties are happening, you know Mollie and Ranger are hosting a Valentine’s Ball! I’m very proud to say that my girlcatfriend Sundae has agreed to be my date. We’re going to RSVP to Mollie soon with a photo of the two of us all jazzed up for the PAR-TAY. If you need details, go to Mollie’s and get them – you surely don’t want to miss this event! Happy Tuesday – Teasers, PAR-TAYS, there’s always something going on in the blogosphere isn’t there? Good Morning Short Story Fans……. I do hope this morning finds you ready for a little chill up (or down) your spine as I present yet another of Mater’s little very short stories. This actually was the FIRST short story she ever wrote and it was published in an online horror magazine YEARS ago (2002 to be exact). It was always there….sometimes barely noticeable, and even at times, practically invisible, but still there. She’d started calling it “The Companion” because it was so reliably a part of her existence that it was something she could count on – almost like a friend, but not as friendly as a friend. In fact, lately The Companion was radiating a decidedly menacing feeling. Gretchen first noticed The Companion when she was twelve years old. Ten years later she’d yet to tell a soul about it. Whenever she came close to telling anyone, The Companion prevented it. The blinding headaches it inflicted upon her were definitely not worth the trouble of explaining The Companion to anyone. At first it had been a barely noticeable shadow just at the edge of her eye – just the smallest darkness which, if she pulled her eyes to the left in her eye socket as far as she could, and as quickly as she could, she could catch sight of. Through the years it stayed just out of sight. She became used to it, as an extremely introverted child, without friends, it was her friend – her companion. She had quickly learned not to tell her mother or father about it because of the resulting pain. Companion. The light seemed to help somewhat. It grew, but not as quickly as it did in the dark. Gretchen no longer went to movies, or night mass at church, or for a drive at night. She made sure everything she did was scheduled in broad daylight, when The Companion was at it’s smallest and least threatening mode. Her best friend Amy teased her about never being able to join her and the other friends she had from work at their once a month “movie nights”, but it was only light-hearted teasing. Amy and the others knew Gretchen had a fear of darkness – they had encouraged her to see a psychiatrist or psychologist about it – but long ago had given up pushing Gretchen to do anything. Gretchen was asleep when the noise started. She awoke with a start to the sound of what sounded like a drum beating. Gretchen was confused in her semi-awake state, but not so confused that she didn’t quickly realize that the noise was perfectly in synch with her heartbeat. But she had never heard her heartbeat before. Then she saw something she’d never seen before. In the corner of her room – the darkest corner, not reached by the bedside lamp – she saw The Companion. With each loud beat she heard, The Companion pulsed. The Companion was not visible at the edge of her sight any longer – it was “detached” from that place and had taken on its’ own separate identity. Not only that, but with each progressively harder beat, it was growing larger. Gretchen was frozen in place….she realized she was shaking – not from cold – but from fear. She was sweating profusely, and could not bring herself to stop staring at The Companion. She felt that if she did stop looking at it – even for a second – it would come towards her. It no longer felt like a “companion” it felt like a separate, malevolent creature, that was waiting for its’ chance to envelop her in its’ inky darkness and extinguish the light that was “her”…..snuff out her very life force. As she stared at The Companion, and if she forced the fear from her mind, she noticed that it was not only no longer growing larger, but in fact was losing its’ extreme “darkness” – it was graying. She felt perhaps it was weakening. The loud heartbeat also subsided as The Companion began fading. She was winning the battle of wills with it. She was feeling strength coming from somewhere within which was conquering her fear and reducing the power The Companion had over her. Gretchen was finally able to move. She got out of bed and discovered her shaking legs were steady enough to carry her into the bathroom. She ran cold water into the sink and bent over to splash it liberally on her face. She stood and stared into the mirror at startled face peering back at her. Then she noticed something else. The Companion was no longer visible at the edge of her vision. It was gone. That meant it no longer was “connected” to her, as she had always felt it was. But what had become of it? 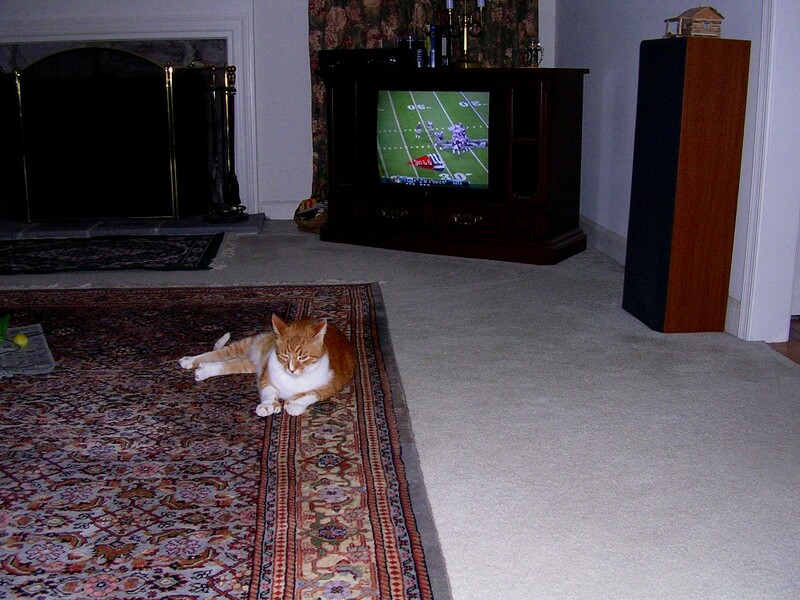 The next few days Gretchen did not see The Companion either at the corner of her eye, or “loose” in her house. Not only that, but she didn’t even “feel” its’ presence. For years and years it had been her constant companion, and now she was alone. She felt liberated….relaxed….no longer trapped. Gretchen enjoyed her freedom. At the library where she worked with her friend Amy, she no longer avoided the dark corners or the basement storage areas. She laughed more and seemed so much more relaxed. She even suggested a movie night with the girls – something she would never have done before The Companion had left her. herself looking out the front window, wondering what it would be like to be out in the night air – alone. Amy pulled up in front of Gretchen’s house and honked the horn. Gretchen picked up her sweater and purse, opened the front door and started to step outside when suddenly the porch light went out. She stood in the total darkness with only the sound of Amy’s car engine for company. A panic seized her, unlike anything she’d felt before. Then she heard it……the heartbeat……the loud drumming heartbeat which matched her heart’s thump beat for beat. She “felt” The Companion before she saw it. It was behind her she knew. The malevolence was palpable…..she was frozen in place and could not move. The Companion was back to claim her. In the midst of her panic she realized Amy’s car had vanished – in fact the distant street lights were no longer visible, nor were the neighbors’ windows lit up from within. The darkness was all-consuming. She felt the ice cold fingers of The Companion on her shoulders first, then the coldness enveloped her arms and legs. She felt faint. It had taken possession of her and her will to fight it was fading quickly. She relaxed in the numbness. Amy honked again, then turned off the car’s engine. She wondered if Gretchen had perhaps changed her mind after all about coming. Come to think of it, the house looked deserted – no lights shining in the window; porch light out. She walked up to the door and rang the doorbell. Nobody answered it. She figured Gretchen had changed her mind so she left to join the other girls at The Cinemax in town. She’d call Gretchen in the morning. But Gretchen wasn’t there Saturday morning, or the next morning, or the next. In fact, she was never seen or heard from again. Then one day, at the library, Amy noticed a darkness appearing in her line of sight – just out of reach unless she pulled her eyes to the left as far as she could………..
And there you have it fans of the chill………I do hope you have a lovely day………those of you who are brave enough to want to read yet another of Mater’s stories after this will be rewarded one of these days when I, Samuel Hitchcat, will return yet again with another thriller/chiller! Do enjoy your Monday won’t you?????????????????? My goodness! 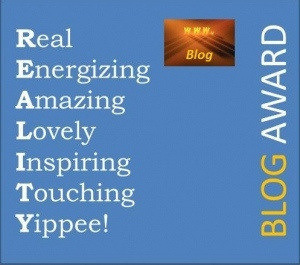 I want to thank TWO different blogs for awarding me the “Reality Blog Award” which is a new one for me. No sooner did I read Princess Zena’s blog to discover she’d nominated me than I read Hutch A Good Life and discovered the guinea pig boys nominated me as well! The rules for this one are (1) visit the blog that nominated you and thank them (done – BOTH of them! ), (2) Link back to the blog that nominated you (done – BOTH of them! ), (3) Nominate up to 20 blogs, (4) Display the award (if I can get my Mom to do some catch up on badge display I’ll have complied with that one too! (5) Answer five questions. 1. If you could change one thing, what would you change? 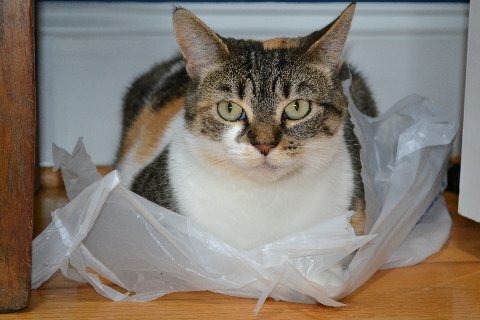 I’d like to be not quite as shy and afraid of other cats as I am because then I might be able to have a “companion”….although I do enjoy getting ALL my parents attention! 2. If you could repeat an age, what would it be? Any year? I suppose this means repeating an age that I’ve been? 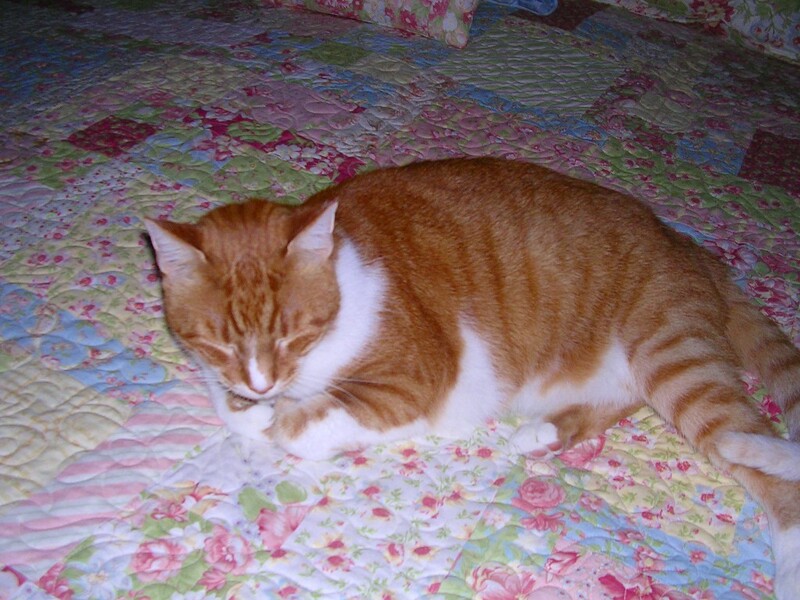 I’d love to be a kitten again – everything was so BIG and so EXCITING and so NEW. My first year would be FUN to repeat! 3. What is one thing that really scares you? The doorbell ringing. I head for the basement. There are lots of things that scare me though…..I hate to admit it but it’s true. 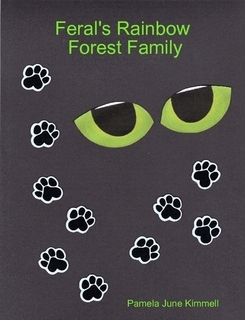 I’m a true “feral” ! 4. What is one dream you have not yet completed and do you think you will be able to complete it? I want to live with my parents at least another 13 years – I truly love my life and my parents and I pray that I will be able to complete this dream. 5. If you could be someone else for a day, who would it be? I wouldn’t mind being a bird for a day – any bird – I just think it would be wonderful to fly. As for nominating other blogs? This award kind of quickly made the rounds so I may be repeating some but here are some friends I don’t think (!!) have been nominated yet! Any of my other friends who would like the award – PLEASE help yourselves and follow the rules if you decide to take it OK? It’s impossible to know who DOES and who DOESN’T want more awards! What else am I up to this fine Sunday? Well, we’re supposed to have an incredibly SPRING-LIKE day and it’s still too early to see if that’s gonna happen or not…..but if it does, I’ll be out in the yard at least part of the day………..sniffing around looking for the trail of Mr. Soggy Bottom Possum, checking out the activity by the bird feeders in the backyard, and having a munch on the grass. You might say it will be a TASTE OF SPRING! 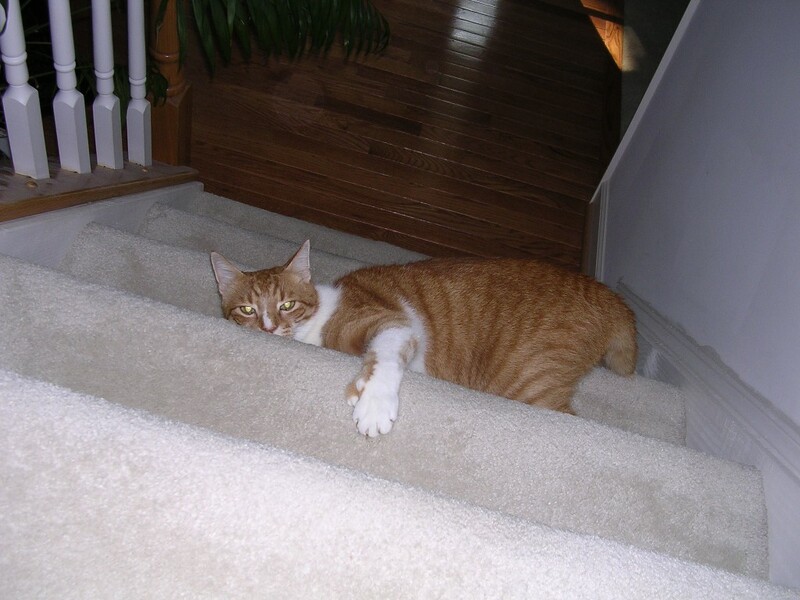 I think I’m in the Twilight Zone……..this is the second time Mom and I started this Caturday blog – WordPress ATE the first draft so here we go with things ONE MORE TIME! Tee Hee………gremlins. So – where was I – oh yes, I was saying that yesterday was a great day for me around here…….after the monster was put back in the closet (cleaning day) I relaxed with Mom…..she cooperated fully by plopping down in her recliner and finishing a book she was reading so that was a purrrrfect opportunity for yours truly – The Napper – to get comfy on her legs. 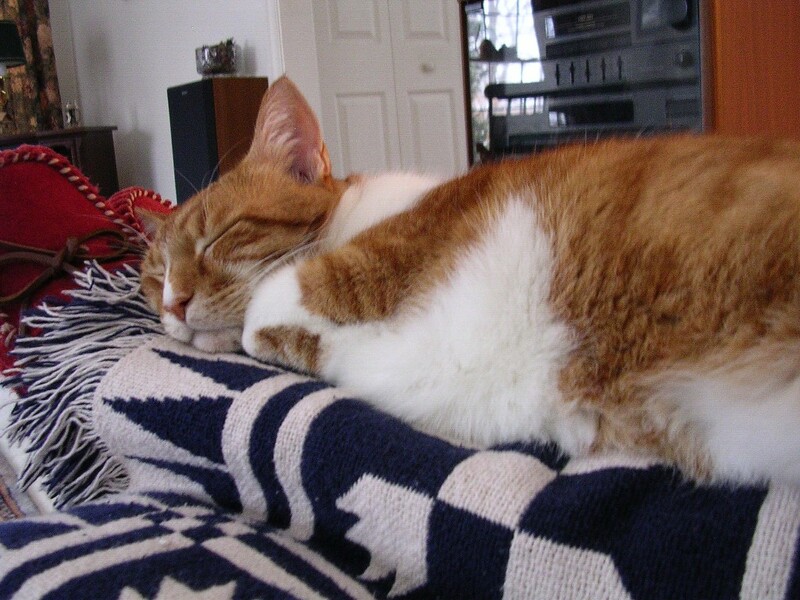 It was an icky day outside yesterday anyway – cold, drizzly, and did I say cold??? It was one of those days you just plain WANT to be inside. At least I did. Dad went outside BRIEFLY to visit the woodpile to bring a stack of wood close to the house so we could have a fire in the fireplace (it was GREAT!). Other than that there was PEACE and QUIET at the Kimmell abode. Sadly there were no sightings of my favorite hot/cold tub bathing Mr. Possum. Mom was ready though – camera at the ready – she’d decided how she was gonna do it without disturbing Mr. Possum and EVERYTHING but he didn’t cooperate. Guess he sat in a rain puddle somewhere and indulged in his “wet bum” fetish elsewhere than on my front porch in Stevie’s water bowl! Today promises to be similar to yesterday with one exception – LOTS OF FOG BECAUSE IT’S GONNA BE WARM! Yes – warm…..in fact we’re gonna be sneaking up to around 70 degrees which is UNHEARD of for mid-January. Perhaps I’ll be able to sneak outside for a grass munch. You never know! 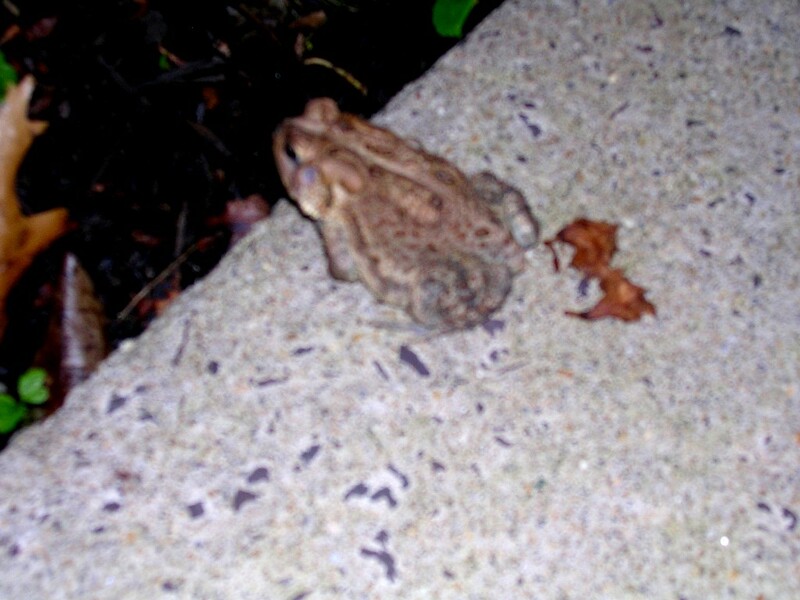 I think it’s a bit early for me to run into my other outdoor friend Freddy the Frog but maybe he’s heard about Mr. Possum using Stevie’s water bowl…………if you’ll recall I’ve discovered Freddy in that bowl once or twice too in the Summer (but I’m sure he was just having a bit of a cool off on a hot day). 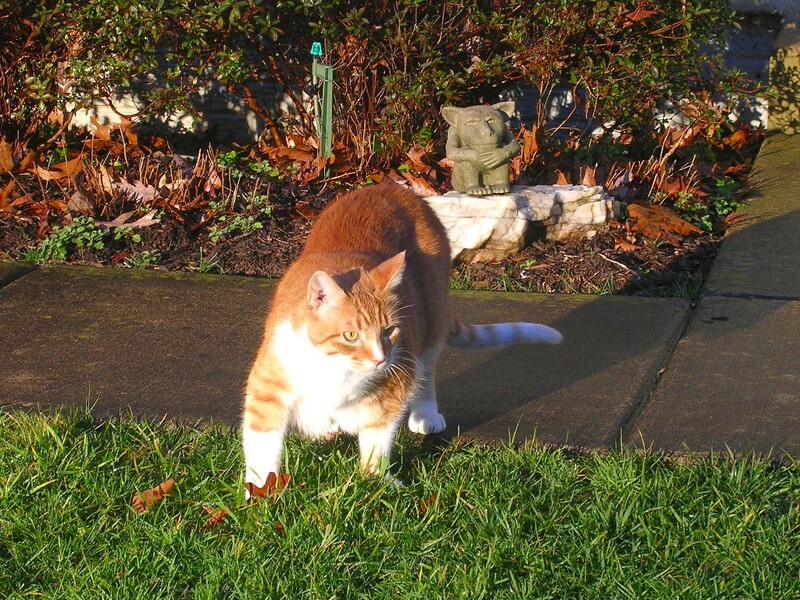 Freddy heading for Stevie’s water bowl! 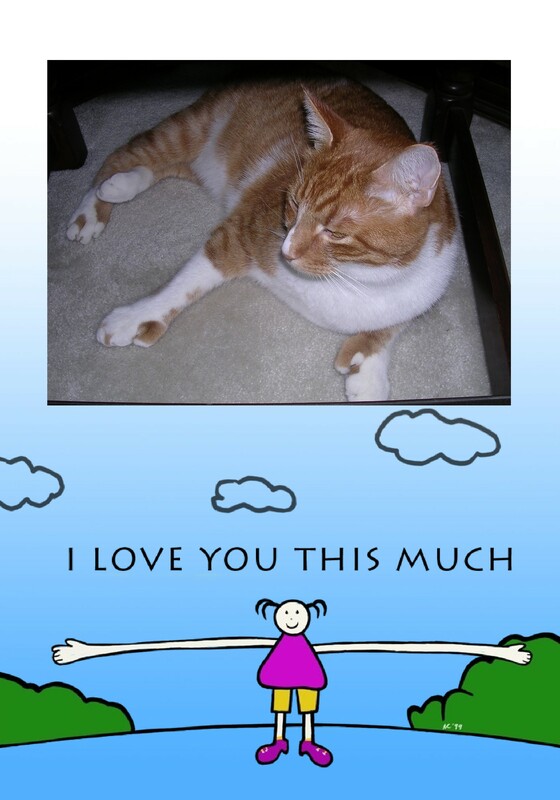 Enjoy your Caturday – whatever it is you do……….and remember this!